I’ve got your Thanksgiving turkey all lined up! Welcome back to our ultimate Friendsgiving 2017 menu! As you can see, we had to take a little detour yesterday, but I have the rest of these amazing recipes loaded and ready to go for you! Whether we’re talking Friendsgiving or Thanksgiving turkey right now, I have a recipe that you do NOT want to miss! 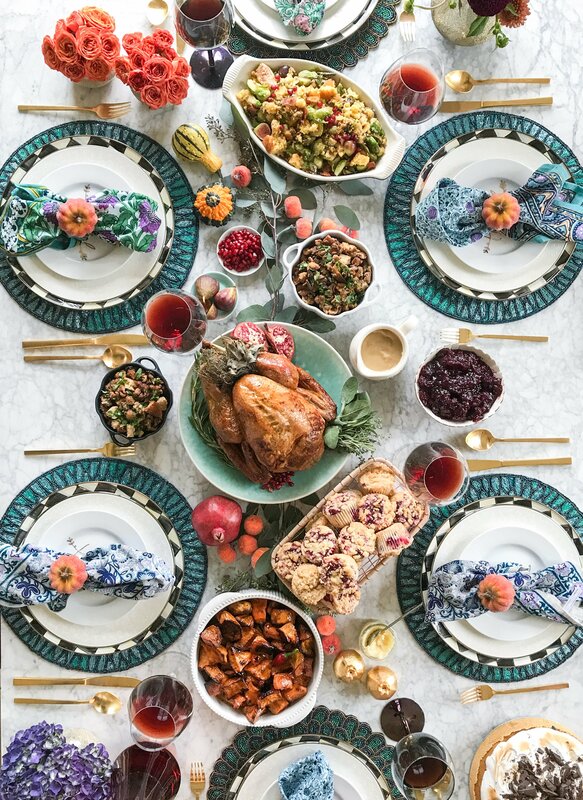 Now this is one of the very traditional Friendsgiving recipes I’m sharing this year – I KNOW – after going on and on and on about how I love untraditional dishes at Friendsgiving. But this turkey is too amazing NOT to share. It is the best turkey I have ever made but also ever eaten. It’s mostly based off of Martha Stewart’s recipe and it is truly drenched in wine and butter. 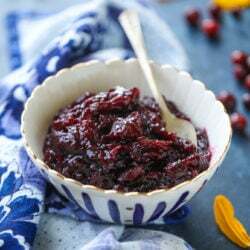 I wanted to share this recipe as it’s what I made for Thanksgiving last year and was the ultimate hit. Super flavorful and just unreal. And I’m not a huge turkey person. I’m a super huge stuffing and gravy person, so there’s that. With the turkey, I sort of just go for it for the tradition. I’m telling you though, with this recipe? You cannot go wrong. I promise. I swear! I’m even making it again this year. With a two week old. It’s not that difficult! What I love about this is that the flavors are rich and intense but not weird or too off that they conflict with other flavors. The leftovers are perfection and even if you’ve never roasted a turkey before, it’s going to be perfect. 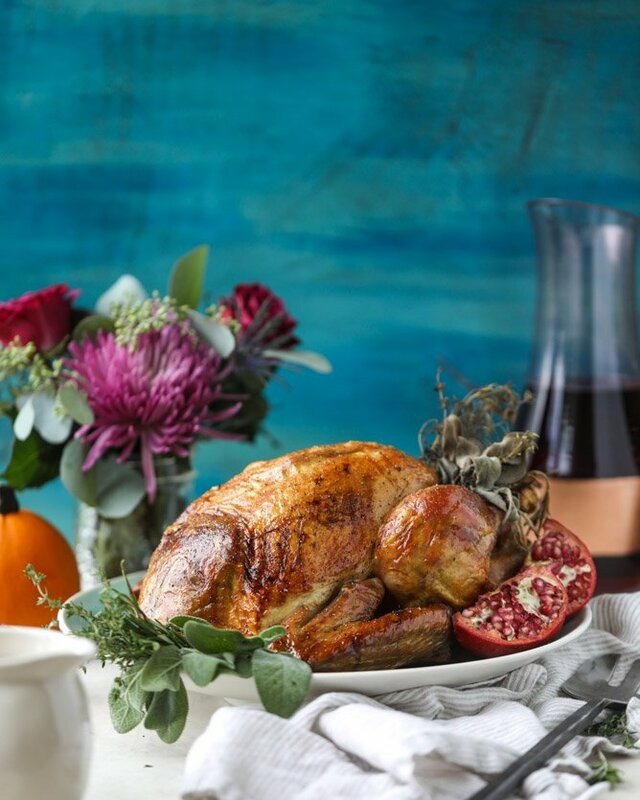 If you feel like brining the turkey beforehand, I have a recipe here but have also used this awesome one from Williams Sonoma before. Otherwise, all you need is some cheesecloth (let’s enlist amazon please), lots of butter and wine. And herbs! And you may recognize this gravy recipe that is my mom’s and works like a charm every time. Our secret is stirring the gravy for a looooong time and having patience. Not my strong suit, but when it comes to incredible gravy? I can get behind patience. Especially when it comes out like this! 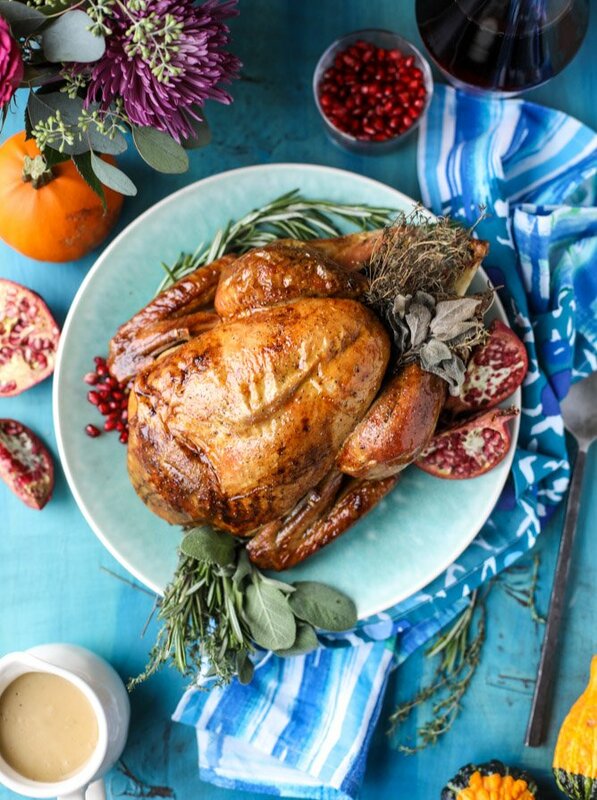 If you want to brine your turkey, this is my favorite brine! I brine for about 24 hours. The night before roasting your turkey, remove any giblets and the neck and pat the turkey dry with paper towels. Place the turkey in a large baking dish. At this point, I stick it in the fridge overnight, uncovered – away from anything that it could touch. I’ve been doing this for a few years and it makes for amazing crispy turkey skin! Remove the turkey from the fridge one hour or so before roasting. Preheat the oven to 425 degrees F. Place the turkey in a roasting pan, breast-side up. At this point, you can fill the cavity with stuffing if desired (my favorite part!). 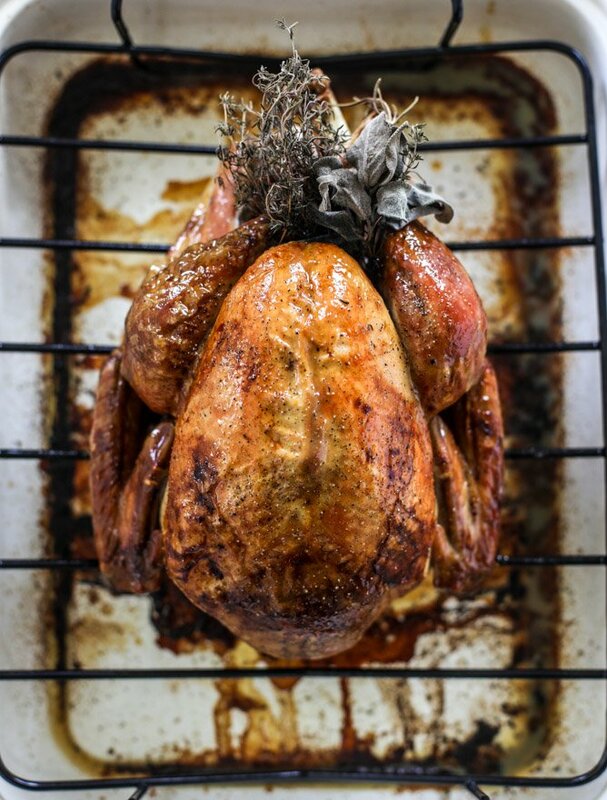 If you choose not to do stuffing, you can add a mixture of fresh herbs, like sage, thyme and rosemary. Tie the legs loosely together with kitchen twine. Tuck the wings under the turkey. In a large bowl, whisk together the white wine and the melted butter. Take a piece of cheesecloth and fold it until you have a 4-layer, 12-inch square. Submerge it in the wine and butter and let it soak for 10 minutes. Rub the turkey all over with the softened butter. Sprinkle it with the salt and the pepper. Remove the cheesecloth from the wine butter and barely wring it out. Cover the turkey bread with the 4 layer cheesecloth. Roast for 30 minutes. Baste the turkey with the remaining butter and wine mixture in the bowl. 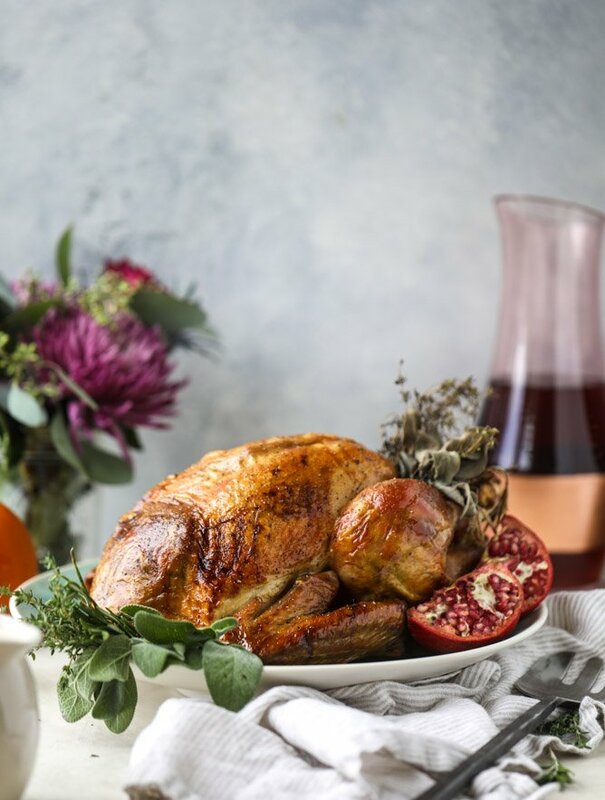 Reduce the heat to 350 degrees F. Roast the turkey for 1 hour 45 minutes or about 2 hours, basting every 30 minutes with the butter and wine in the bowl, or the drippings from the bottom of the roasting pan. After 2 hours, gently remove the cheesecloth. Continue to baste the turkey liberally with the drippings or the butter and wine. Roast it for about 60 more minutes, until the temperature taken in the thigh reaches 180 degrees F.
Strain the drippings from the roasting pan into a large pot or saucepan and set it over medium heat. You can also make this gravy directly in the roasting pan, which is what we often do! Add the cold water to a shaker bottle (or water bottle/mason jar) and add the flour on top. Shake the heck out of it for 30 to 60 seconds, until the flour seems completely incorporated and creates a slurry. With a whisk or fork in one hand, pour the slurry into the drippings, sitting constantly with the other hand. Continue to stir to avoid any lumps and stir until the gravy has thickened, anywhere from 10 to 20 minutes. Make sure you are scraping the bottom of the pan. We stir out gravy for a LONG time. Taste the gravy and season it to your liking. Set it over low heat for serving. My mom stores her extra gravy in the fridge for about a week. To reheat it, she places it in a saucepan (it will look gelatinous and disgusting) and adds a touch of water or stock. She heats it over low heat, stirring occasionally, until it’s back to it’s original consistency. Like soups and sauces, it often tastes better the next day! You can easily make this with a smaller or larger turkey, just by adjusting the amounts of butter and wine! Now just trust me, I know you can do it! Ohhhhhhhhhhhhh! What a fantastic surprise! AMAZING!!! I have got to try this! I live for turkey. 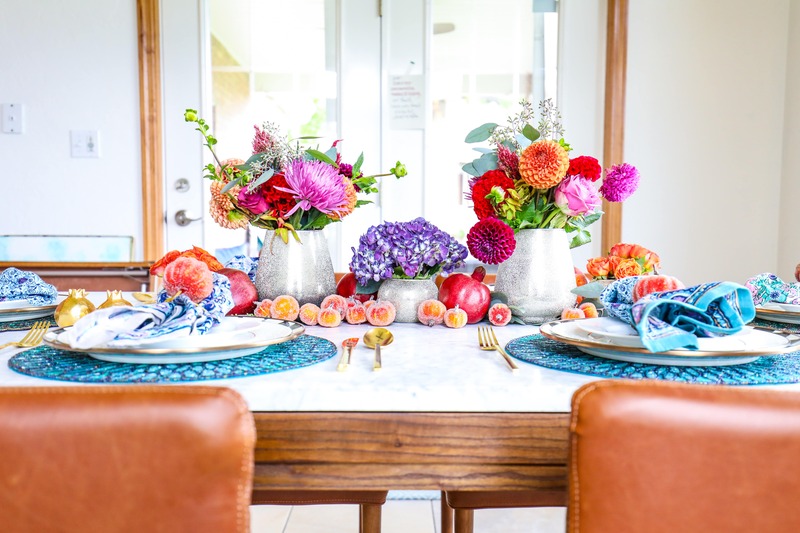 That table setting is to die for! Love love love. That tablescape is AMAZING!!!!!! I’ve been trying to decide how to cook the turkey this year and I might just have to do this one. thanks girl! you HAVE to try this version. it’s unreal. My sister has made her turkey this way for years ever since reading it in a Martha magazine and it’s so good! Congrats on your new little turkey! it is the best!! thank you so much cate! AHH so many good things in this post! Would love to know more about your table setting too. It is perfection! Can I swap out the white wine for champagne? dry or sweet? I have an overstock of the stuff and my fine white wine is way too good to pour over a turkey; that stuff needs to go in a glass and straight into my belly ;). hmmm i’m honestly not sure – i wonder if the carbonation would affect it somehow? i wouldn’t go with too sweet if you try it, probably a drier one. but i haven’t tried that before! I’ve tried beer can chicken & I’ve seen recipes with champagne-can chicken, so I’m guessing it’ll turn out similar. Hmm, I’ll give it a trial run this week with the “dry” stuff. Thanks! Wow this non turkey lover is fully converted! Bring on the butter, wine and deliciousness! I’ve been doing the Martha turkey for years and it’s my favorite as well. The last 2 years I swapped apple cider in for the wine and the gravy from the drippings was so good! Congratulations on your newest addition to your Thanksgiving table this year! omg that is a wonderful idea! i might try it! lovely setting! I’m so inspired, I really like your mom’s gravy recipe too! Thank you for sharing and congratulations on your detour! I have made this Turkey every Thanksgiving, for the last 15 years or so. Ever since I found the recipe in a Martha Stewart Living magazine. The turkey is a tremendous hit evey single time! I am happy to know that I am not the only cook in the universe who thinks it is THAT good! The gravy made from the drippings of this recipe is awessome too. Much like you I am not a big turkey person but more of the stuffing and gravy side of things, with this recipe I actually look forward to the turkey too. This looks absolutely amazing!! For the brine, are you just rubbing the turkey with all those ingredients, patting it dry and then putting it in the fridge for 24 hours? Great recipe! I made this last night as my Thanksgiving “test” turkey. However, the skin on the breast of my turkey never browned and I didn’t really have much drippings in the pan after it roasted. 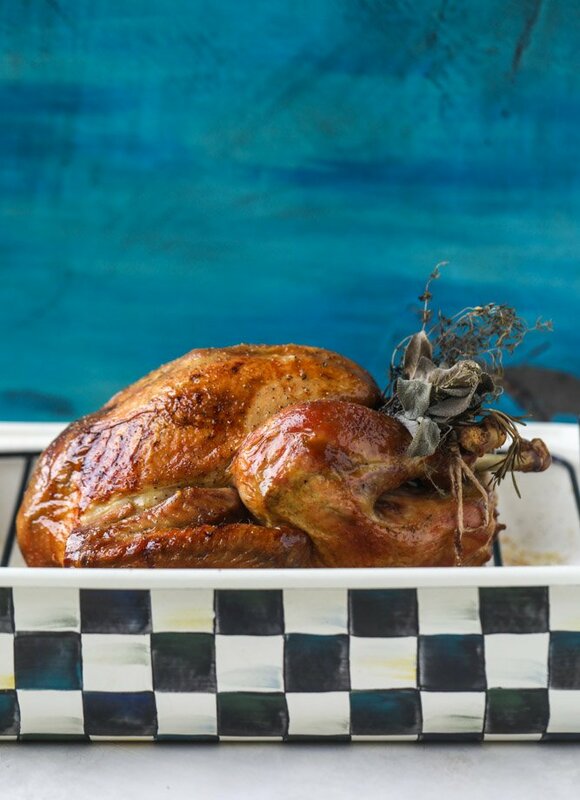 I made the turkey by this recipe last year and it was amazing! All the family members were delighted.